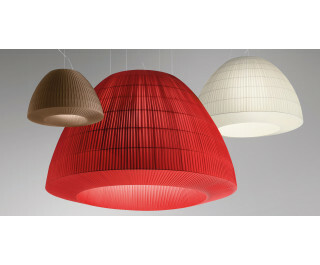 Bell is a collection of pendant lamps, ceiling lights and wall lamps with a metal structure hand wrapped in ribbons of super-smooth, fireproof pongé fabric. The pendant lamp is the characterizing piece of the collection, and, with its bell shape presents an imposing structure that fits different environments such as hotels, restaurants and other contract settings. Bell, in its smaller dimensions is perfectly suitable also for private spaces. The Bell hanging lamps and all the other typologies are available in ten colors, in various dimensions and several light sources.